'Highly recommended. I think it will make children wriggle with delight.' - Stephen Fry. This entirely unique collection of wildly witty words offers a surprise around every corner, from the ongoing rivalry between the author and illustrator (mean poem and cruel portrait included), to the mysteriously misnumbered pages that can only be deciphered by a certain code-cracking verse, to a poem that is 100% genuinely infinite. Meet a balding werewolf, competitive boulders, a birthday piranha, and find out if grown-ups really are better! Chapter - 14: Fight Fire with Fire? Chapter - 22: Hey, Kids! Get Your Parents to Read You This Poem! Chapter - 23: Hey, We Finally Found Someone Who Knows That Story About the Snail Who Saved San Francisco! Chapter - 45: Just Because I'm a Turkey Sandwich and Some Chips Doesn't Mean I Don't Have Feelings Too, You Know! Chapter - 69: Picture Puzzle! Chapter - 70: The Poem That's Titled "The Door"
Chapter - 71: The Poem That's Titled "The Poem That's Titled `The Door'"
Chapter - 72: The Poem That's Titled "The Poem That's Titled `The Poem That's Titled "The Door"'"
Chapter - 73: The Poem That's Titled "The Poem That's Titled `The Poem That's Titled "The Poem That's Titled `The Door'"'"
Chapter - 77: Roller Coaster + Earthquake = ? Chapter - 78: The Rules of "TIC"
Chapter - 88: Toasted Knight for Lunch Again? Chapter - 98: What? You Think I Have a Bad Memory? Chapter - 102: Worst. Birthday Party. Ever. Chris Harris is a writer and executive producer for How I Met Your Mother and a writer for The Late Show with David Letterman. His pieces have appeared in The New Yorker, Esquire, ESPN, The New York Times, The Wall Street Journal, and on NPR. He lives in Los Angeles, loves peppermint stick ice cream and, when he's not too full, just-a little-bit-more-peppermint-stick-ice-cream-but-don't-tell-anyone. 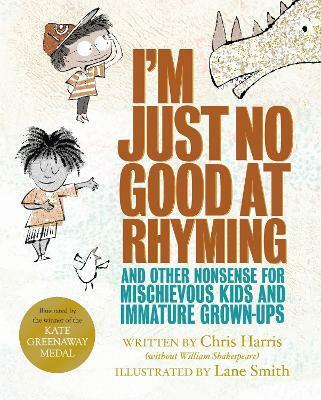 He's a funny guy, as you can tell from his children's poetry collection I'm Just No Good At Rhyming. In his spare time, he gets older. Lane Smith is the creator of It's a Book, It's a Little Book, Grandpa Green and A Perfect Day. In 2017 he won the CILIP Kate Greenaway Medal for There Is a Tribe of Kids. Lane Smith and his wife, the designer Molly Leach, live in a small town in rural Connecticut, USA.